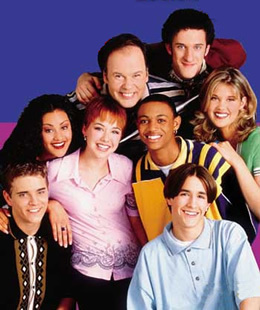 Performers include: Dennis Haskins, Bianca Lawson, Isaac Lidsky, Bonnie Russavage, Robert Sutherland Telfer, Natalia Cigliuti, Jonathan Angel, Dustin Diamond, Christian Oliver, Spankee Rogers, Sarah Lancaster, Salim Grant, Richard Lee Jackson, Samantha Esteban, Anthony Harrell, Ben Gould, Lindsey McKeon, Ashley Lyn Cafagna, and Tom Wade Huntington. With Zach, Screech, and the others all graduated from Bayside High School, Mr. Belding (Dennis Haskins) has a whole new crew to watch over on this Saved by the Bell spin-off. Taking over for Zack Morris by breaking through the “fourth wall” and talking directly to the audience is Scott Erickson (Robert Sutherland Telfer). He recently transferred to Bayside from Valley High School. Scott falls in love with popular Lindsay Warner (Natalia Cigliuti), but has to first get through the Bayside quarterback, Thomas “Tommy D” De Luca (Jonathan Angel) to win her affections. One of Scott’s friends is the very dorky Barton “Weasel” Wyzell (Isaac Lidsky). He’s been Lindsay’s best friend since preschool and helps Scott win her heart. Weasel’s heart belongs to Megan Jones (Bianca Lawson), but she doesn’t want anything to do with him. She’s the brain of the bunch and tends to be the voice of reason. Megan is good friends with Lindsay and Vicki Needleman (Bonnie Russavage), a cheerleader who has a crush on Scott. Scott, Weasel, and Vicki eventually leave Bayside, but new friends end up replacing them. Brian Keller (Christian Oliver) is a transfer student from Switzerland. Bobby Wilson (Spankee Rogers) is the new cool kid and Rachel Meyers (Sarah Lancaster) is wild about shopping and fashion. It’s around this time that Screech (Dustin Diamond) returns to the high school, working as an assistant to Mr. Belding. Megan, Brian, and Bobby move on from Bayside as three new students transfer in from Valley High School. Ryan Parker (Richard Lee Jackson) picks up where the other schemers left off. Maria Lopez (Samantha Becker) is another cheerleader while R.J. “Hollywood” Collins (Salim Grant) is another student who loves fashion. As original characters Lindsay and Tommy D move on, Hollywood also bids adieu, just as quickly as he came. Nicky Farina (Ben Gould), Ryan’s stepbrother from New York, moves to Bayside, and falls for Katie Peterson (Lindsey McKeon). Football player Eric Little (Anthony Harrell) comes to the school as well. Next, Rachel leaves as Liz Miller (Ashley Lyn Cafagna) moves to Bayside and joins the swim team. Both Ryan and Nicky fall for her. Ryan leaves Bayside, but another guy, Tony Dillon (Tom Wade Huntington), begins at the school and quickly falls for Maria. While many of the faces at Bayside change over the years, Mr. Belding and the students’ crazy escapades remain a constant.